New positive review on Presma® Hawk 6 Series 3-18X50 Precision Scope, RGB RXR Glass Reticle via the Mail After Purchase email review system. 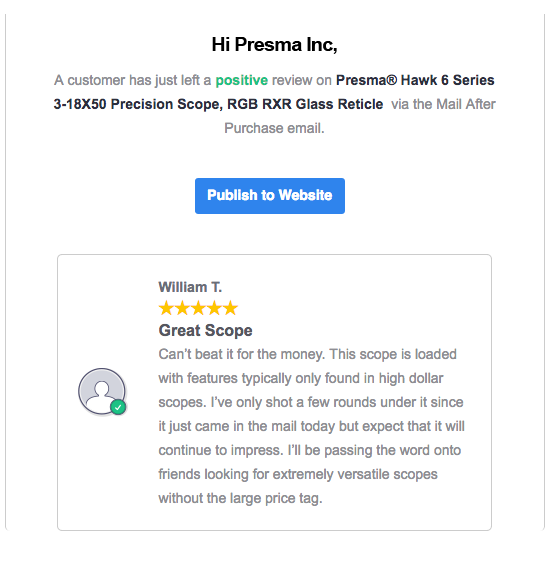 A customer has just left a positive review on Presma® Hawk 6 Series 3-18X50 Precision Scope, RGB RXR Glass Reticle via the Mail After Purchase email. Can’t beat it for the money. This scope is loaded with features typically only found in high dollar scopes. I’ve only shot a few rounds under it since it just came in the mail today but expect that it will continue to impress. I’ll be passing the word onto friends looking for extremely versatile scopes without the large price tag.